New comics show up in comics stores (and on many of your favorite portable devices) every Wednesday. But which ones are worth buying? As always, I have some suggestions. Criminal: Last of the Innocent #1 Ed Brubaker writes reliably excellent crime comics. This is the first issue of his newest one. Doctor Who Classics: Seventh Doctor #5 I know so little about Dr. Who that I can't even tell you the guy's first name (does he have one?). I do know that this reprint series includes a story written by Grant Morrison and drawn by Bryan Hitch, two of the most acclaimed creators in the business. For that alone, I'll buy this. Fear Itself: The Deep #1 Marvel's big crossover continues this week with a new issue of Fear Itself, but I'm more interested in this spin-off mini-series that involves an underwater attack on the Sub-Mariner that brings the mystic Dr. Strange to his rescue. The selling point for me is writer Cullen Bunn, whose work I recently discovered via a superb Captain America back-up story and a strong run in Superman/Batman that involved the DC icons in a future where the forces of magic reigned. I've not read enough of Bunn to say his work is guaranteed to be good every time, but I've liked all that I've read of his so far. Flashpoint Batman: Knight of Vengeance A new issue of DC Comics' big crossover series Flashpoint is out today, along with the first of dozens of spin-off issues, most of which will form a batch of three-issues mini-series. All occur in an alternate version of the standard DC universe of Superman, Batman and Wonder Woman, a version where everyone but the Flash and Booster Gold are somewhat different. Of all the tie-ins released this week, the Batman one is the most deserving of attention, for two reasons: 1) It appears that, in this universe, Batman's alter ego is Bruce Wayne's dad and 2) the creative team of writer Brian Azzarrello and artist Eduardo Risso are among the finest duos working in comics. Readers of 100 Bullets can confirm this. DC Universe Online Legends Official summary: "Coping with his failure to save Metropolis and the loss of Lois and the Daily Planet, Superman makes a tactical mistake that could cost the JLA dearly. Plus, a new hero has emerged to save the day on Earth—and his name is Lex Luthor!" 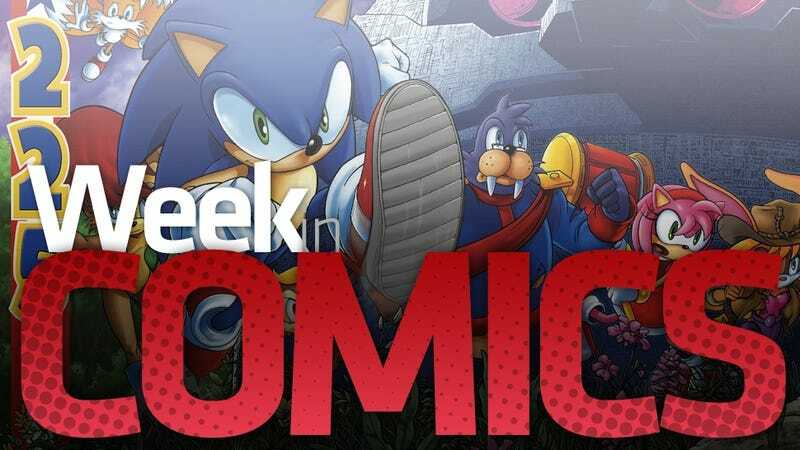 Sonic The Hedgehog #225 Official summary: "One Step Forward...' Sonic's 25th-anniversary celebration begins here with a double-sized gatefold cover! Dr. Eggman's newest creation threatens all of Mobius, forcing Sonic to team up with the evil Ixis Naugus. It's a race against time with a world-changing ending you won't believe! The prelude to 'Genesis' starts here with this anniversary issue!" Wolverine #9 by Jason Aaron. This was a standalone issue featuring a very angry Wolverine fighting the shape-shifting Mystique, while they both suffer the interference of a new character named Lord Deathstrike. This new character, a master assassin, is introduced early in the issue when he murders a man in China by aiming a powerful gun that he is holding in Argentina and shooting it into the ground at just the right angle. Ridiculous? It works. It's a great issue that shows why Jason Aaron is one of the best writers of monthly comics today. The top people at DC Comics announced on Tuesday that they'll be re-numbering their super-hero comics and launching 52 new first-issues in September, as part of a revision of their super-hero universe that will introduces changes big and small across their line. A Kotaku reader asked what I thought of this. I'm most excited by DC's promise to release new issues of its super-hero comics digitally on the same day they're sold in comics shops, starting this September. Some see it as an insult and possibly an injury to retail shops. I do believe it's the latter. I will probably shift most or all of my DC super-hero comics purchasing to digital. I'll happily to support my local comics shop by purchasing graphic novels and collections of the best stuff I read, but for most monthlies, I would prefer purely digital versions. My home has finite space, space I don't want to over-stuff with comics any more than I want to with CDs or cassette tapes. This is the way things are going.